Uppababy is a high-quality line of strollers and other baby gear that can help make your life as a parent on the go more convenient. The Uppababy Vista is one of the most popular strollers and travel systems available today. It is the only stroller that your child will ever and is a great investment for growing families because it can be used and reused over the years and still remain extremely durable. One reason why this stroller system is so popular is because of how versatile it is. It goes from a bassinet that can be used with newborns, to a travel system that makes the transition from carseat to stroller easier. It can also be used as a single stroller for toddlers or be made into a double stroller for an infant and toddler. The Uppababy Vista stroller has gone through several changes from its 2015 model. The 2015 release was a major upgrade while the 2017 had a few minor updates and a broader range of colors. Since this stroller is so well-made, it is perfectly fine to purchase an older, used model, especially if you get a good deal since the brand isn’t affordable. But which past model should you go with, or should you instead invest in a 2017 Uppababy Vista stroller? Check out these Uppababy Vista Reviews for more information and assistance with making the right decision. The Uppababy Vista Stroller from 2015 meant big changes for the brand. This update brought along many of the features that are still very popular with the stroller today. 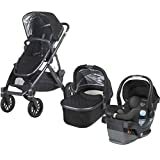 This includes the second seat feature that transforms the single stroller into a handy double stroller, ideal for families with more than one child, the solid and durable frame, the size of the storage basket, how the stroller folds and the bassinet feature. This stroller features high, off the ground seating, adjustable recline settings, and tires that can hold up regardless of the terrain. The bassinet is ideal for getting baby to sleep and there is also a convenient foot brake that makes it easy to stop and take a break. The travel system folds much easier than past models, it can even fold down with the stroller seat still attached which is a plus for many parents. The frame is also very lightweight making it easy to stow and go. After all the upgrades to the 2015 model, the Uppababy Vista stroller continued to be a great choice for parents. This lightweight stroller weighs only 27.5lbs. and can be used with children from Birth up to 50 lbs. The travel system adapts to the needs of your growing family with a bassinet, rain cover, and an insect shield all included. The multiposition recline feature allows your little one to take a nap with ease while you are on the go. There is an extra-large basket underneath the seat that can carry up to 30 lbs. of essentials, and the one-step folding feature makes it easy to place the stroller in the car, minivan or storage. The new frame combines both aluminum with magnesium to create a strong and sturdy frame that is easy to move. It also features a single piece bumper bar that is easy to clean. The Uppababy Vista Stroller for 2017 is simply the best all-in-one stroller that you can invest in, based on the information from more than one Uppababy Vista reviews. It is extremely practical because it can accommodate the travel needs for an infant or a toddler, or both at the same time. 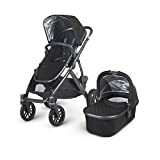 Use the bassinet with a newborn for quick walks around the neighborhood, and keep the stroller to use as your baby grows into a toddler for day trips to the park or zoo. The Uppababy Vista 2017 is available in eight stylish colors It comes with a matching bassinet, bumber bar, rain cover, bug cover and a bassinet bug cover to keep your little one comfortable. Some of the key features include the large canopy that has a SPF 50+ pop-out sun visor that can reach all the way to the bumper bar for optimal protection. It also has an adjustable handle bar making it comfortable for taller or shorter parents to use. This model also includes all-terrain wheels that are solid and never go flat. It can take on all types of terrain such as grass, gravel and uneven pavement. It doesn’t matter if you are a first-time parent or have a house full of kids, buying a new stroller can be a challenge. If you want to invest in a stroller that will adapt with your growing family, an Uppababy Vista is a good choice, no matter which model year you decide to go with. Reading up on these and other helpful Uppababy Vista reviews will help you narrow down your choices and make a well-informed decision.